Objective: To investigate the pattern and distribution of stroke in Trinidad and Tobago from 2000-2009. To identify the prevalence of co-morbid conditions among new stroke patients during the period under surveillance. Methods: Data were collected from May 2010 to July 2010 from the clinic of 728 new persons treated stroke at one of the main treatment centers. Variables measured included age, gender ethnicity, smoking status and co-morbid conditions. SPSS (Version 17) for Windows and ARC GIS version 9.3 were used to facilitate both descriptive and inferential data analysis. Results: Of the 728 new hospital admissions for the period January 2000-December 2009 for stroke, 369 (50.7%) were males and 359 (49.3%) were females. 59.8% were South-East Asian; 30.5% were African and 9.7% were mixed ethnicity. The predominant age group was 60 - 69 years (n = 215, 29.5%) while less than 1% were under 30. Ischemic stroke accounted for 352 (48.4%) of all new cases for the period; Hemorrhagic stroke accounted for 14.6% (n = 107), with 37% (n = 269) classified as other unspecified condition (including unknown). Of the 728 cases examined, 171 patients died before being discharged and 552 were treated and discharged. Information of 5 cases was not available. Using this data, the overall case fatality ratio was calculated as 23.5%, with the case fatality ratio for males being 23.2% and the equivalent ratio for females being 22.9%. Using a standard classification, the majority, (n = 389, 53.4%), of cases were classified as mild; 246 (33.8%) were deemed moderate, and 93 (12.8%) were severe cases. Hypertension was clinically diagnosed in 80.9% of the cases; 56.3% were diabetic, and 21.7% were classified as smokers having been either past or current smokers. Other lifestyle risk factors such as obesity and exercise were not examined due to the lack of the relevant data. The most frequent cardiovascular risk factor was chamber enlargement being present in 33.2%, while the second most frequent was left ventricular hypertrophy, 26.9%. The other cardiovascular risk factors examined included Ischemic heart disease, atrial fibrillation and previous myocardial infarction. All of which were present in less than 15% of the patients. Conclusion: The incidence of stroke in Trinidad and Tobago continues to be an important public health challenge as we complete the first decade of the 21 century. We provide important evidence on the changing epidemiological patterns of the disease, providing the first attempt to describe a possible stroke belt in the southern half of the island. The first global estimate on the burden of 135 diseases was provided by the 1990 Global Burden of Disease (GBD) study which showed that cerebrovascular diseases ranked as the second leading cause of death after ischemic heart disease  . In 2001, it was estimated that cerebrovascular accident (CVA/stroke) was the second leading cause of death globally, accounting for 5.5 million deaths worldwide, or 9.6% of all deaths, with approximately 70% occurring in low and middle income countries  . More recent the GBD study 2010 showed that although age-standardised rates of stroke mortality have decreased worldwide in the past two decades, the absolute number of people who have a stroke every year, stroke survivors, related deaths, and the overall global burden of stroke (DALYs lost) are great and increasing  . It is remarkable that there are very few stroke studies outside of the developed world when data are indicating that the majority of strokes are occurring in developing countries. High quality health statistics are essential for planning and implementing health policy in any country. In this regard, WHO developed an international stroke surveillance system called the “STEP wise” approach to stroke surveillance (STEPS-stroke)  . This approach forms a framework for surveillance and data collection for all WHO Member States. The first (step 1) of the three steps is the collection of information on stroke patients admitted to heath facilities. The benefits of this activity include providing evidence of the magnitude of stroke, identification of segments of the populations at risk and monitoring trends over time. In respect to the latter, the last study to report on CVA from Trinidad was for the period 1994-95 by Mahabir et al.  . They reported 1105 hospital admissions with the diagnosis of stroke for the one year period. In addition, the hospital case-fatality rate was 29%. The median length of stay was 4 days, with an interquartile range of 2 to 9, and accounted for approximately 9478 beds per annum, thus emphasizing that stroke in Trinidad in the 1990’s was a major public health challenge. Several modifiable risk factors were also identified and the need for effective preventative strategies was recommended. The aim of this study therefore is to determine the changing pattern of stroke in Trinidad and Tobago over the first decade of the 21st century. In addition, we investigated demographic factors, subtype of stroke, cardiovascular risk factors, and geographic distribution of patients presenting with stroke at the San Fernando General Hospital during the period 2000-2009.
WHO defines stroke as ““rapidly developing clinical signs of focal (or global) disturbance of cerebral function, with symptoms lasting 24 hours or longer or leading to death, with no apparent cause other than of vascular origin”  . By applying this definition transient ischemic attack (TIA), which is defined to last less than 24 hours, and patients with stroke symptoms caused by subdural hemorrhage, tumors, poisoning, or trauma will be identified and excluded from the analysis. However for the purposes of this study, stroke was clinically defined as the sudden onset of a focal neurological deficit of a presumed vascular etiology and lasting more than 24 hours. This was the single important entry criterion for the study. Accepted standards that are predated were used to diagnose stroke and stroke subtypes that included clinical, laboratory and non-invasive imaging and vascular studies, cardiac evaluation and information from autopsy studies. This included all ischemic and hemorrhagic strokes. The two ischemic stroke subtypes used are: atherothrombotic brain infarctions (ABI) and cardioembolic infarctions (CE), and the two hemorrhagic stroke subtypes are: intra-cerebral haemorrhages (ICH) and subarachnoid haemorrhages (SH). The neurological deficits found while examining an acute phase of stroke while it occurred was used to define the severity of the stroke. This definition was then broken down into four categories: none (no deficit), mild (deficit present in visual, motor, sensory or language domains but without functional impairment), moderate (deficit requiring assistance in one of the domains mentioned above), and severe (deficit requiring assistance in at least two of the domains). The 28-day case-fatality is a common parameter for the short-time survival in stroke patients  . Stroke patients who died within 29 - 180 days from the beginning of a stroke defined the long term case-fatality rate. We used a retrospective incident case series design. The population for this study is all patients admitted to San Fernando General Hospital for the period 2000-2009 with a physician diagnosis of stroke. We aimed to achieve a sample size of approximately 1000 stroke patients. The San Fernando General Hospital was specifically chosen to allow comparison with the study reported by Mahabir and colleagues in 1998. The starting point of the study was a review of admission log books from all the respective wards admitting patients with stroke. All patients identified through this method had their unique hospital identification number, name and date of admission extracted. This information was used to retrieve all patients’ medical records. Each medical record was carefully reviewed by two independent investigators to ensure that all patients met the entry criterion. All socio-demographic and clinical data were then extracted from the patient’s medical record. All data was stored and password protected using a pin available only to investigators in SPSS version 16.Means and SDs were used to describe patients’ characteristics. Categorical variables were compared using the χ2 test and a 2-tailed P < 0.05 was considered statistically significant.The protocol for the study was approved by the University of West Indies Ethics Committee. During the period 2000-2009, 798admissions with a diagnostic label of CVA, Cerebral hemorrhage, TIA and brain stem infarct were carefully reviewed. Using the definition for TIA by the joint American Heart Association/American Stroke Association Stroke CouncilAmerican and other societies  , 70 patients were classified as having a TIA and were subsequently excluded from the analysis. Thus, 728 patients (369 males and 359 females) were classified as having a first-ever stroke. All patients were crossed checked to ensure that only the first event for stroke was recorded, and that repeated admissions over the period were not counted as an event. The mean age of occurrence of a stroke was 66 ± 12.4 years; there were marginally more males (51%) females. Ischemic stroke was the most frequent subtype (48%) followed by intracerebral hemorrhage (15%), and undetermined stroke (37%), Table 1. TIA which was not included in the analysis represented 8.7% of admissions. The largest proportion of patients (30%) was seen in the age group 60 - 69, Figure 1. Case fatality rate (using the MONICA definition: the proportion of events that are fatal within 28 days of onset) was 23.5%  . In Trinidad there are two major ethnic groups Africans and South East Asians (SEA) each representing 40% of the population. There was a significant (χ2, p < 0.05) ethnic disparity in the occurrence of stroke among SEA (53%) compared to Africans (27%). Further analysis Table 2, shows hospital admission rates according to age, gender and the number of strokes in each ethnic group. For every age group among men the admission rates were higher in SEA than in Africans. Similarly for every age group except ≥ 80 years stroke occurred more frequently among SEA than Africans. The admission rate for those of mixed ethnicity was significantly lower than those for SEA and Africans, for both male and female cases within all age groups. The highest number of first time stroke cases in African males was 33 while in South-East Asian males it was 60, both occurring in the age group 60 - 69 years. In African females, the largest number of first time stroke cases was 30, occurring in the age group ≥80 years, while the equivalent for SEA women was 59, occurring in the age group 60 - 69 years. The trend in stroke admission over the 10 year period 2000-2009 is displayed in Figure 2, apart from the years 2005 and 2006 labeled red there was an overall increase of stroke with time. In fact there was more than a 50% increase in cases in 2000 compared to 2009. Figure 1. The percentage distribution of stroke cases by age-group and gender. Figure 2. 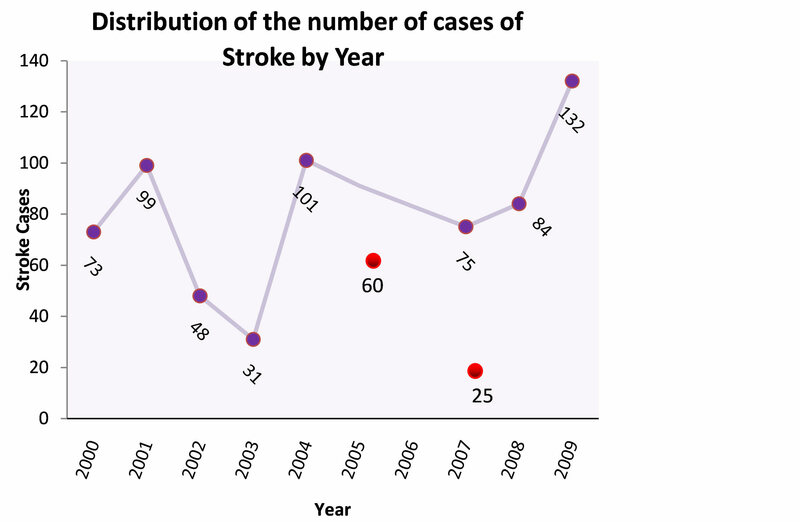 The distribution of the number of cases of stroke by year. comorbid conditions associated with stroke patients. They account for approximately 50% of all patients admitted, irrespective of gender and ethnicity. Smoking in our setting continues to be a major contributor of stroke, since as much as 20% of people who experienced a stroke smoked. The most common cardiovascular complication was chamber enlargement closely followed by left ventricular hypertrophy. Both of which were present in approximately 25% of patients at the time of the stroke. Atrial fibrillation was associated with about 7% of patients who had stroke. Previous myocardial infarction (MI) was the least prevalent risk factor, occurring in only5% of patients presenting with stroke. Table 1. Characteristics of patients admitted to the san fernando general hospital, by gender. Table 2. Hospital Admission rates for stroke cases by age, gender and ethnic group. 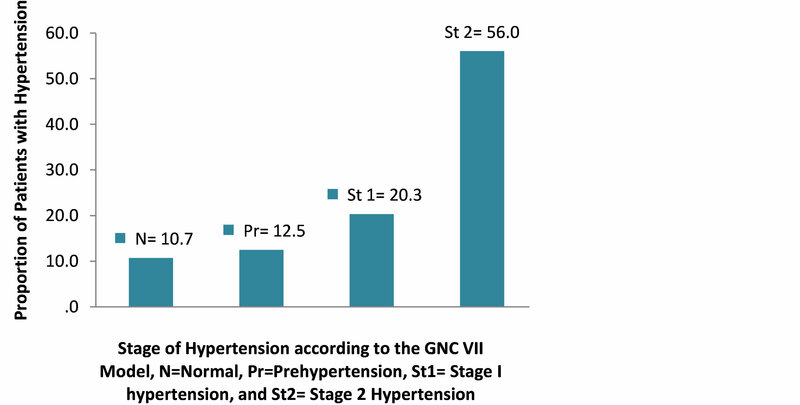 Since hypertension was the predominant risk factor occurring in 80.8% of patients, using the JNC 7 classification for hypertension  , we classified the stage of hypertension of the patient at the time of the stroke Figure 3. Over three-quarters of the patients were in stage 1 and 2. The neurological deficits found on clinical examination during an acute phase of stroke were used to define the severity of the stroke. Specifically, the extent of the stoke was separated into 4 categories; (1) none = (no deficit), (2) mild = (deficit present in visual, motor, sensory or language domains but without functional impairment), (3) moderate = (deficit requiring assistance in one of the domains mentioned above), and (4) = severe (deficit requiring assistance in at least two of the domains). Using a cut point of 60 years were compared the severity of stroke in patients ≤ 60 years and ≥ 60 years, Table 4. More than 50% of the stroke cases were classified as mild s in both age groups. However persons ≥ 60 years had twice the risk of developing a stroke with severe deficit than those under the age of 60. All incident cases of stroke in which the residence of the patient was identified were used in a preliminary enquiry into the geographic distribution of stroke in the southern half of the island, thus allowing only a crude analysis. The map generate disdisplayed in Figure 4. The nonrandom distribution of stroke across the southern region, the large magnitude of the difference between highand low-rate areas, the similarity of the distribution for different race-gender groups, and the lack of delimitation by administrative or political boundaries, together suggest that the pattern of excess stroke is not an artifact of different diagnostic and reporting practices. These preliminary findings hint of a possible stroke belt around the inner cities of this region. On the other hand different methodological approaches to describing a Stroke Belt and temporal changes in this region greatly influence interpretation. Hence a more detailed analysis is required to confirm if in fact a stroke belt exsist in this region. Table 3. Risk factors assessed in stroke patients. Table 4. Severity of stroke based on neurological deficit by Age. Figure 3. Stages of hypertension in stroke patients. Figure 4. Map of the distribution of incident stroke cases in the southern half of the island. had a confirmed diagnosis of first-ever stroke on admission to hospital. The prevalence more than doubled from 4.63 per 100,000 in 2000 to 10.7 per 100,000 in 2009. Therefore, unlike developed countries such as the US which has experienced a decline in stroke over the past 20 years, stroke continues to rise in Trinidad. The agespecific prevalence rate showed a general increase with the age group 60 - 69, which shows the highest occurrence of stroke (29.2%) unlike what was reported by Mahabir et al. where most stroke cases were seen in patients over the age of 75  . Furthermore, we found a case fatality rate of 23.5% which is less than the 29% reported by Mahabir et al. Mortality from stroke has been declining in most industrialized countries  . The reason for the decrease has not been fully explained; possible causes include better treatment, a shift toward milder strokes and changes in risk factors over time  . In our setting, better treatment is a plausible explanation for the decrease in case fatality rate. The occurrence of stroke was approximately the same in both men (369/728) and women (359/728). The two major Diaspora on the island are South-East Asians (SEA) and Africans representing 40.3% and 39.5% of the population respectively according to the 2010 population census. Stroke overall was almost twice as common in SEA (385, 53.0%) than Africans (197, 27.1%). Mahabir et al. reported in 1998 that the occurrence of stroke was 46% in Africans and 38% in SEA. Our findings now differ from that of Mahabir et al. in which the previous ethnic gap in the occurrence of stroke has not only closed but changed direction. However in the USA, Black and Hispanic people are at a greater risk of stroke than white people  . The importance of this finding should now aim to reduce the risk and consequences of stroke among racial and ethnic groups most vulnerable. Particularly to understand the risk factors such as inadequately controlled hypertension, hypercholesterolaemia, and diabetes; people in these racial and ethnic groups are also less likely to use emergency medical services after a stroke, especially the case in Trinidad where many patients use alternative care and also receive drugs for secondary prevention. Diabetes was found to be relatively more significant in SEA (60.3%) than Africans (49.2%). This finding concurred with that of Mahabir et al. where a clinical diagnosis of diabetes was more common in SEA (37.9%) than Africans (25.5%). Smoking was present in 20% of the stroke patients indicating that current smoking cessation strategies continued to be poorly implemented. In concurrence with the study by Mahabir et al., we also found that hypertension was the predominant risk factor (80.8%) for stroke. In fact, 56% of strokes occurred in patients with stage 2 hypertension. Data from observational studies involving more than 1 million individuals had indicated that death from both IHD and stroke increased progressively and linearly from levels as low as 115 mmHg SBP and 75 mmHg DBP upward  . It had been estimated that a 5 mmHg reduction of SBP in the population would result in a 14% overall reduction in mortality due to stroke  . To correct and to ensure that, undiagnosed, untreated, or uncontrolled hypertension is optimally managed clearly which places a substantial strain on the health care delivery system. Therefore, partnerships between the client and the health care provider, with the client driving the process have to be considered as an alternative approach for developing countries, for example, a modified DOTS model. The severity of stroke was assessed and classified. Among all the age groups, mild strokes were most prevalent having an occurrence of over 50% in both males and females. In both genders, moderate strokes were almost as common and severe strokes were seen to be more present on males than females but in low incidences (less than 20%). Since most of the stroke cases were classified as being mild, the functional prognosis would improve with the implementation with proper diagnostic and management procedures. Our study was restricted to San Fernando General Hospital. As a result, our data may not reflect the entire stroke population in Trinidad and Tobago. We were unable to obtain all the Ward Admission books on the relevant wards. In particular, there was a difficulty in obtaining information for the years 2005 and 2006. Another issue of importance for measurement of stroke incidence in a population is the accuracy of the diagnosis. We have acknowledged the possibility of misdiagnoses since we relied solely on the information recorded by medical staff in the patient files. However, the symptoms and signs are often easy to elicit such that misclassification is not a major problem in this study. In conclusion, we provide evidence important for planning regarding stroke medical and rehabilitative care and preventive activity. In addition, we report the frequency and rate of occurrence within a defined community during the first decade of the 21 century. Furthermore, we identify the sort of persons who fall victim to such attacks, the extent to which they are affected (and survive), and their exposure to facilities where diagnostic and specialist care is available and utilized. Murray, C.J.L. and Lopez, A.D. (1996) The Global Burden of Disease. 1. Harvard School of Public Health, Boston. World Health Organization (2002) The World Health Report: 2002: Reducing Risks, Promoting Healthy Life. World Health Organization, Geneva. Mahabir, D., Bickram, L. and Gulliford, M.C. (1998) Stroke in Trinidad and Tobago: Burden of Illness and Risk Factor. Pan American Journal of Public Health, 4, 233-237. Dunbabin, D.W. and Sandercock, P. (1990) Preventing Stroke by the Modification of Risk Factors. Stroke, 21, 36-39. Singh, R.F., Suh, I.F., Singh, V.F., Chaithiraphan, S.F., Laothavorn, P.F., Sy, R.F., et al. (2000) Hypertension and Stroke in Asia: Prevalence, Control and Strategies in Developing Countries for Prevention. Journal of Human Hypertension, 14, 749-763. Sidney, S., Rosamond, W.D., Howard, V.J. and Luepker, R.V. (2013) The “Heart Disease and Stroke Statistics—2013 Update” and the Need for a National Cardiovascular Surveillance System, on Behalf of the National Forum for Heart Disease and Stroke Prevention. Circulation, 127, 21-23. Whelton, P.K., He, J., Appel, L.J., Cutler, J.A., Havas, S., Kotchen, T.A., et al. (2002) Primary Prevention of Hypertension: Clinical and Public Health Advisory from the National High Blood Pressure Education Program. The Journal of the American Medical Association, 288, 1882-1888.